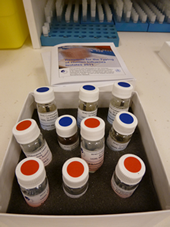 The Melbourne WHO Collaborating Centre provides a kit of influenza reagents so that participating laboratories may conduct their own preliminary identification tests on samples. The kits contain reagents which are appropriate for the identification of isolates obtained from recently circulating viruses of influenza types A(H1N1)pdm09, A(H3N2) and B viruses using the haemagglutination inhibition assay. The B reagents will allow the identification of the two lineages of B viruses the B/Yamagata-lineage and the B/Victoria-lineage. The reagents consist of inactivated egg-grown antigens and antisera prepared in rabbits and are suitable for identification of both egg-grown and cell-grown influenza isolates by the HI (haemagglutination inhibition) test. They will work with turkey red blood cells (RBC), chicken RBC, guinea pig RBC or human RBC. It is recommended that turkey or mammalian RBC are used although chicken RBC can be used successfully if the virus has been passaged in eggs. Kits containing reagents for 2018 are currently available from the Centre. 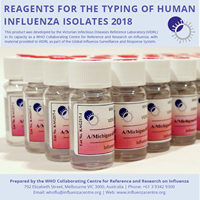 If you are a laboratory performing influenza diagnosis and wish to receive the HI typing kit please email us at whoflu@influenzacentre.org. There is no charge for the kit although there may be some charge for transportation. This document is provided as an Adobe Acrobat (.pdf) files. The Adobe Acrobat Reader is available free of charge from Adobe's website.